Rachel Hackenberg‘s new book will change your life. Not might. Not could. Not may. Will. Change. Your. Life. On Tuesday night, I threw myself onto my bed with a stack of work to do, including plowing through her book for this review. I wanted to spend time with it, but I just didn’t feel like I had time. It’s two weeks before Easter and there are no pauses, sacred or otherwise. I took a big slug of red wine and picked up the book. The richly textured cover and the smooth pages that slid like tall, sturdy grass through my fingers forced me to slow down. Even before I finished the introduction, I was already allowing for how I could certainly figure out how to make a little more time on Wednesday, so I could have a little more time with this book now. 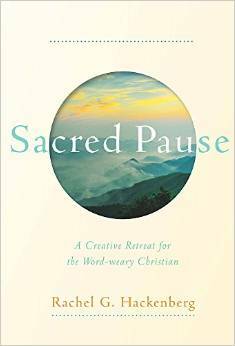 Sacred Pause: A Creative Retreat for the Word-weary Christian is the rare book that is exactly as advertised. It is a retreat in your hands. Each chapter guides the reader into thinking beyond the words of our faith practice, our memorized scripture, and our beloved hymnody. God is in these details- nuances of sound and shapes, verbs and nouns, colors and texture. Creative praying is Hackenberg’s gift in execution and in education. Sacred Pause takes creative prayer beyond the conversations into a lived quietude and spacious openness to the Regal, the Roustabout, and the Rambunctious (my newly inspired Trinitarian formula). Many of us have had this thought as we work toward welcoming new members into our communities. 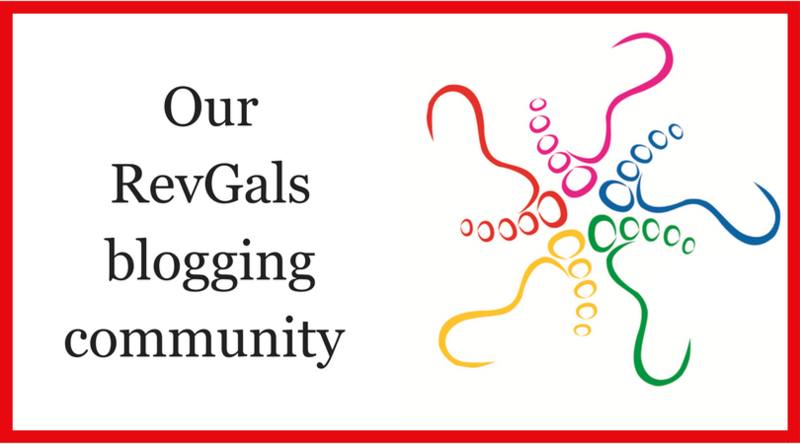 How do we explain the words we all know? Hackenberg breaks into the presumed circle of understanding and asserts in a brilliant way that none of us may be using words that are meaningful to us beyond their long associations. If I am using words in way that is meaningful to me because the structure is how my grandmother taught me, how am I connected, in community, to you who did not know my grandmother? 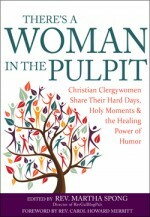 We frequently wrestle with the context of scriptural guides in terms of behavior, but perhaps it would behoove us to set that aside and spend imaginative time together wrestles with the scriptural guides to our vocabulary, imagery, sensory spiritual experience, and lived reality of encounters with the Holy. I have never, to this date, reviewed a book I did not finish. I’m breaking that self-imposed code now. I need time with this book. My reading on Tuesday night made me rethink how I was planning to teach on Wednesday night. Instead of the question that I planned to start a discussion, we discussed what images and experiences come to mind, our feelings and thoughts, about the phrase “for the sake of the world”. What is the world? What is “for the sake of”? The conversation, I truly, believe went so much deeper because of the space that was created in which the Ruach danced. You need this book. Not as an e-book, but as a tangible reality on your desk, in your bag, and beside your bed. You need this as little retreat interludes, little paths by still water, a pocket moment of spiritual direction. This book comes with my highest commendation: Get it now because it will help you with Holy Week. I completely agree, Julia. This book is a treasure to hold, to read, to savor. It’s already affecting my teaching and preaching. Just purchased. Thank you Julia (and Rachel) ! Wow! Sounds amazing…. I’m getting on it now! Rats! Not available here yet…..
would you like me to order one and bring it over? Elapsed time between reading your last sentence and clicking “place your order”: roughly 30 seconds. I’d already been meaning to buy this book, but your review pushed me immediately from “mean to” to “MUST NOW.” Thank you! Can’t wait to dive in to this book! A wonderful book. I couldn’t put it down. Have re-read it three times. Purchased (albeit on Kindle). Thank you for this enthusiastic review! I am in need of an inspirational nudge these days.